Finally, on to the next chapter in the Apartment Tour: the master bedroom. As you'll see in our floor plan, we have two bedrooms and two bathrooms. When this was Alex and his brother Dylan's bachelor pad, our current guest bedroom/office belonged to Alex and Dylan had the master. When I moved in over the summer, I discovered there was quite a bit of wall damage in both bedrooms (stains and scuffs) so we got permission from our landlord to paint. After living in white-walled apartments and dorms for a few years, I was craving a bit of color. The downside is that we'll have to paint the walls white again before we move out, but for now, I've been loving having some color around. When Alex and I were registering for linens before our wedding, I changed my mind about our duvet cover at least 4 times. In fact, I was so indecisive about it that I finally decided just to go with plain linens and bring color in with throw pillows. That way, I could change out the color scheme every so often without having to invest in all new linens. I started looking for throw pillows with modern, graphic prints that would coordinate with my brown-stained wood childhood dressers and I fell in love with an organic linen pillow on clearance at amenityhome.com. The rest of the room design stemmed from there. To create visual interest, I decided to pair this dark gray pillow with contrasting bright white linens. Though white obviously isn't the most practical color for linens, because we have a duvet and not just a comforter, it's easy to remove the cover and wash it when necessary. 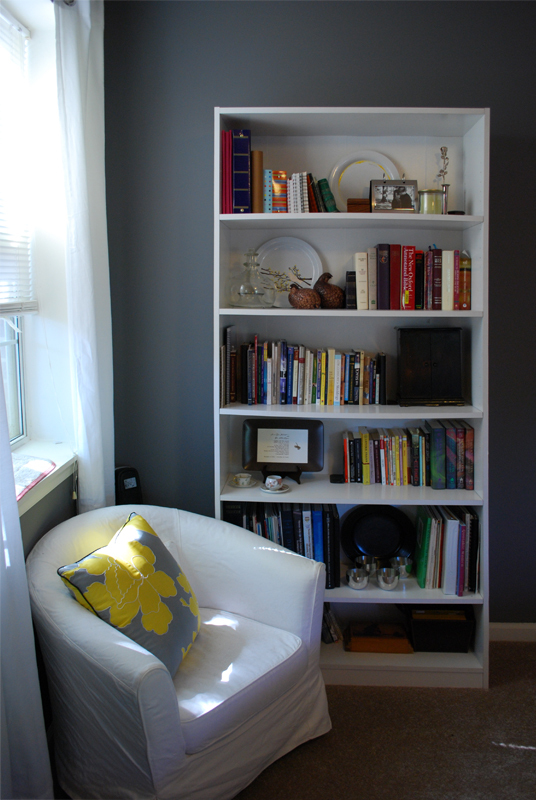 The dark gray paint on the walls (Olympic low-VOC paint in Dover Gray) really sets off all of the white elements in the room (bed linens, curtains, chair, and bookcase) and together, they create just the right balance of dark and light. A few months ago, our bedroom was chosen as a contender in the Apartment Therapy Room for Color Contest and though it didn't make it past the first round, I got a few nice comments from some readers. 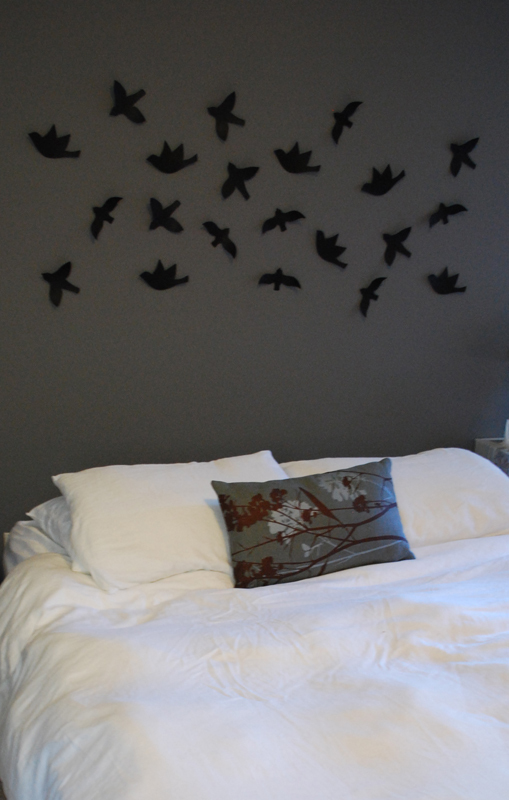 The only negative comment was from one unfortunate reader, likely in need of a new glasses prescription, who thought that the birds above the bed (by Umbra for Target - a graduation gift from my mom) were bats. Just to avoid any additional confusion, they are most definitely birds. (Sidenote - I'm hoping to upholster a tufted headboard for the bed someday). You can see in the before picture (top) that the stains on the wall were brutal. A fresh coat of paint made all the difference. 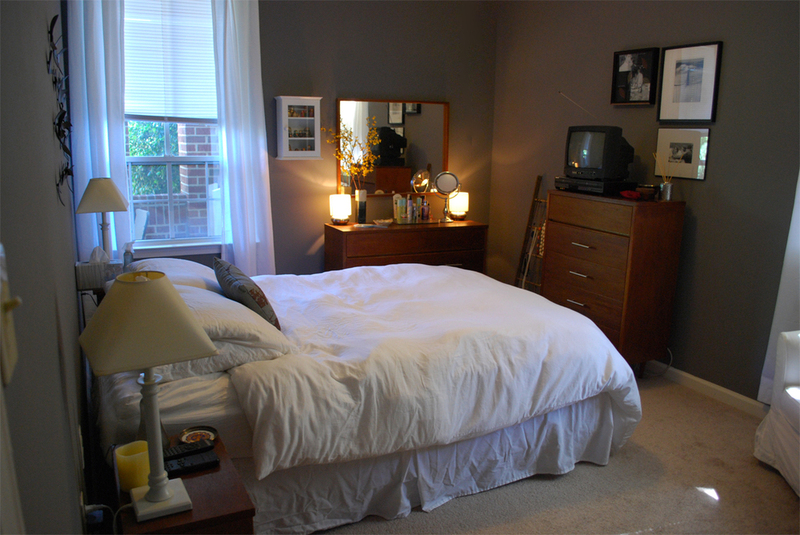 The furniture in the room includes a queen sized bed that Alex had in college, my childhood dressers, mirror, and nightstand with new modern brushed nickel hardware, Alex's college nightstand, my childhood bookcase, and Ikea chair with a white slipcover I bought in college. The dressers and mirror were part of a kit that my dad built in the 60s. While I hated the set growing up, I now love the clean lines and the "mid-century" modern feel of the set. My only wish is that we had two matching nightstands. The lamps and the artwork were also things we already owned. By choosing a neutral color for the wall and the linens, our accessories become the focus in the room. With yellow as the primary accent color along with features like matryushka dolls from Alex's trips to Russia, the accessories add an extra layer of color and texture to the room. This jewelry display is made with an old ladder I bought for $14 from an Antique shop in Fredricksburg. I love this because not only are my necklaces easily accessible, but they become part of the artwork in the room. This bookcase was in my room growing up as was this Ikea Tulsta chair, but with books and accessories, they both work well in our grown-up bedroom. The accessories on the bookcase are mostly hand-me-downs with the exception of the three plates. I had bought them from the Salvation Army Thrift Shop before our wedding and was planning to use them as an alternative guest book. We ended up going another direction with that so rather than re-donate the plates, I decided to paint them. The pillow on the chair is by Dwell from Target and the ledge behind is one of our cat Freckles' favorite spots to watch the birds. Speaking of birds, how many can you find in this bedroom?